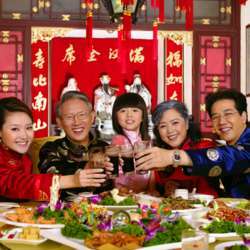 Join us for a delicious traditional Chinese New Year's Banquet to welcome the Year of the Pig ! and of course.. Chinese Fortune cookies ! Price includes Chinese tea but other drinks can be ordered and paid separately. As places are limited and I need to confirm and pay the restaurant in advance, you will be requested to pay your contribution at the latest by January 25th Protected content . As soon as you sign up, I will send you more details about the money transfer, with many thanks for your kind understanding. It is not possible to pay the meal on the evening itself.